Fire up the grill and make these sweet and savory Teriyaki Beef Kabobs with Pineapple and Peppers. Pair with a brown rice or quinoa for a scrumptious, nutrition-packed meal. 1. In medium bowl, whisk together sesame oil, ginger, garlic, red pepper flakes, teriyaki sauce, pineapple juice and soy sauce. Divide and set aside. 1. Place beef cubes into a large zip-top bag. Add half of the marinade, seal the bag removing extra air and mix. Refrigerate for at least two hours or up to overnight. Place remaining half of marinade, to be used for basting, in a sealable container and refrigerate until ready to cook. 1. Preheat grill. 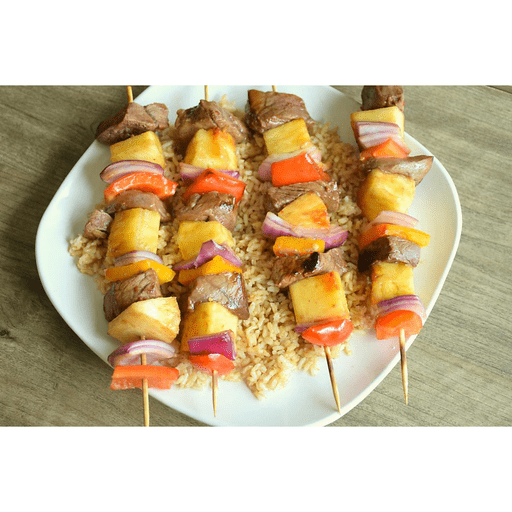 Thread beef cubes onto skewers, alternating with pieces of pineapple, red onion and bell pepper. Discard any remaining meat marinade. 1. Grill kabobs over direct heat for 2-3 minutes per side. Move kabobs to area of indirect heat and brush with reserved marinade. Continue to baste until all marinade is used. Cover and cook until done (internal temperature of 145°F). Transfer to platter and let rest for 5 minutes. Serve. If using bamboo skewers, soak in water for 30 minutes prior to using. Calories 280, Total Fat 14g (Saturated 5g, Trans 0g), Cholesterol 65mg, Sodium 670mg, Total Carbohydrate 19g (Dietary Fiber 1g, Sugars 14g), Protein 20g, Vitamin A 20%, Vitamin C 90%, Calcium 4%, Iron 10% *Nutritional values are an approximation. Actual nutritional values may vary due to preparation techniques, variations related to suppliers, regional and seasonal differences, or rounding.